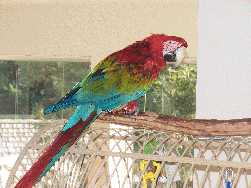 Ed the greenwing macaw is back with Mickaboo! I`m Ed, also known as Ozzie -- not the rock star, but from the old comedian team of Ozzie and Harriet. I came to MIckaboo with my sister Frieda, back in 2008. We ended up moving to Arizona, where we lived for years with a bunch of cockatoos. Sadly my sister died a couple of years ago and I`ve been the only macaw in the house. Cockatoos are okay, but have you ever tried to have a conversation with a cockatoo? They`re a bunch of flighty drama queens! My dad knew I was not happy and asked Mickaboo to find me a home where I might find intelligent conversation with another macaw or at least have a human companion of my own. It takes me a while to trust new people, but once I do, I`m a very good friend!